In upholding a lower court’s ruling, the Supreme Court said Greg and Harlan Siewert of Zumbro Falls are free to seek damages from Northern States Power Company, the parent of Xcel Energy. When the two moved to their new farm in 1989, they noticed the milk production decreased from their 150-200 cows. Experts said it was because electrical current returned to the ground through the cows. The court rejected the utility’s claim that any damages would impact electricity rates in violation of state law, especially if it had to redesign its electrical distribution system. OK, so they moved into an area that is not good for animals to produce milk and are sueing because of it? Or is it that Xcel Energy claims that the power lines are not the cause? They don’t claim the powerlines aren’t the cause. They changed an isolator or something which reduced the stray voltage, though the farmers say there still is some — though reduced — voltage. They didn’t move into an area that was not good for animals to produce milk because stray voltage wasn’t much known back then. If you look at farmland all over Minnesota, there are a lot of powerlines running through it. So, if you stand around there, can you feel it? as a dairy farmer i can tell you that cows are much more sensitive to electricity than people are. even a small amount of current can cause problems, most people would not even notice the stray voltage. Much we do not know, why aren’t we studying this? Why aren’t we studying cows/cattle more? What are the effects of them from many things…what they eat or don’t eat, what drugs are pumped into them etc. before they become our food. I am mystified by the lack of concern. While there is much we in agriculture do not know – the neat thing is agricultural people are concerned about the issues you mentioned- catte behavior, comfort, dietary requirements, drugs, food safety etc. Tthere is a lot of time, effort, money and trial work looking at those issues and in most cases entire journals pubished monthly looking at those critical issues. Just putting the words stray voltage, catte behavior, dairy cattle nutrition, will briing up plenty of reading material if you truly want to become more educated on the subjects. Stray currents could easily occur in barns because of various leakage faults, but it’s hard to imagine stray currents due to long overland transmission lines. Currents due to abnormal unbalance would flow far below the surface of the earth and leakage faults would be heard and seen by anyone in the area. Cows may be extraordinarily sensitive but any influence on them, electical or not, would be measureable. They would quickly feel any important electrical influence and an equally sensitive farmer would see his animals seeking to avoid it..
Let’s clear up some mis-perceptions on this issue. 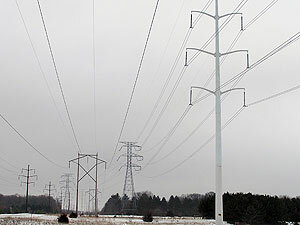 The current, antiquated US electrical distribution system’s design consists of “grounded” circuits where transmission lines and all domestic and on-farm systems are connected to the earth (ground) via copper rods. Ohm’s Law states in concept that “electrical currents will take any and ALL pathways back to their point of generation”. In the majority of the United States, “stray currents” (non-wire of various, usually minute amperages) are constantly traveling through the ground back to their point of generation at the power facility. These “earth currents” will take any and all pathways to “jump back on line” including the grounding systems in the direction of the power plant. The visible “sub-stations” you may see are simply locations in the grid where thousands of copper ground rods have been pounded into the earth to receive these “stray currents” to allow them easy acces to return to the “wired system”. Farms located near or in line with these sub-stations are usually at higher risk for earth current damages depending on where the “end of the lines” may be located for the various utility companies serving their area.. Each farm farm, if wired to code, also has to have ground rods and more importantly, always has a water well system(s) that are typically used as the ultimate, deep-earth grounding device. Unfortunately for modern dairy cattle, their heavy dependence on massive intakes of water to support the production of large volumes of milk (mainly composed ofwater) puts them at high risk for being a very good conduit of stray currents. Research has shown that animals are quite sensitive to minute currents in their environment leading to increased levels of adrenal cortisol circulating in their bloodstream indicating a stressful condition. As known in human medicine, chronic elevation of serum cortisol in cattle is also very detrimental to long term health and often leads to multiple, eventually fatal conditions. Alterations in animal behavior (current avoidance) in dairy cattle is often the “canary in the mine shaft” for the dairy producer. I recommend that every dairy farm should have water meters installed to measure how much water their herd is consuming on a daily basis. Normal intakes for each herd can be established and if any departure from normal is noted, an investigation should be instigated until a cause and correction is accomplished. Finally, it is common knowledge that the utilities fear the astronomical costs anticipated from being forced to update their out-dated distribution systems-and justifiably so. In the meantime, our dairy animals standing within their “earth-grounded” grid continue to suffer. The States that truly want their dairy industry to thrive (and not just survive) will be the FIRST to update their rural distribution systems–anything less constitutes animal neglect. Do you hear me Wisconsin?? We had stay voltage in 1980 when we build a new barn. We caught it right away. Install a isolation transformer and it took care of it. My understanding of the problem is that it is the inbalance of the three phase lines. The inbalance in electricity has to move back through the ground in the US, because they don’t run a neutal on their lines. This is a cost saving in not having to run another line. This is done in Canada, running the fourth line, I been told. I knew a lot of folks that have had problems and everyone seam to be on the end of a line at least the biggest problems. I’m no experd. Dr. David Lang was doing reseach on stray voltage. I believe the time was the later 1980’s until the grant he was working under was cut. Can anyone tell me if the problems that rural farmers have had with stray voltage have been exoerienced in a more residential setting? I live in central WI (serviced by WPS) in a very residential neighborhood and we have high power lines running through a portion of our backyard. Today, I was sitting on my kids (wooden) swingset and in areas of the swing chain wear the protective plastic coating had worn away, I was getting small shocks. After checking the swing with a multimeter, we recorded fluctuations between 2.5-5 volts of current. We also tested a number of other kids structures in the backyard including a 28’above ground swimming pool. All registered varied amounts of voltage which decreased the further away from the lines we tested. We contacted WPS who sent someone out to look. They said they would pass the info on to an engineer on Monday. Any thoughts/suggestions/advice. At this point I’m a little concerned, especially since we noticed certain changes in both physical & mental health in the past few years with unexplined reasons. We moved in here 5 years ago. Please contact me at schneiderlawfirm@yahoo.com at your earliest convenience. I am eager to speak with you about your thoughts posted. Thank you. This is a problem that has been happening in Michigan and Wisconsin, as well. There are two videos that address the concern: “The Effects of Low Level Non-Linear Voltages and Frequencies Applied to Livestock” and “Beyond Coincidence: The Perils of Electrical Pollution” which I obtained from Stetzer Electric in Wisconsin. The first one will show some EMF meter readings in relation to real time cow behavior. If we think we are simply seeing some isolated random damage from regular electrical stray voltage right now,… I’ll wager we have seen nothing yet. Wait until we witness the vast quantities of dissipated microwaves off leaky old transmission lines once every component of the smart gird – or should I say the “stimulus plan funded grid” which Obama is using up all of your remaining tax dollars to build – s put in place. Then you can bear witness to the corporate implemented and taxpayer funded full deconstruction the ecosystem entirely. the lines are not desinged for the telecom industry. The farther the signal has to go, the more they turn up the microwaves to get there. This is door-to-door delivery of frequency generated radiation on a scale unheard of. the animals will be the first to succumb. The frequency disease fall out will lay waste to every species in its path. It ain’t the “smart” meters. They are simply multiple frequency enablers. Its the weapons grade FREQUENCIES. We stop this thing now or we are hooped. Lawsuits are unfolding, like the one in Oregon, using expert witness Barry Trower who designed these exact same frequencies for lethal use by the military. Trouble is the law moves slower than the grid deployment. Since cognitive impairment is a primary side effect, act now before it is too late.